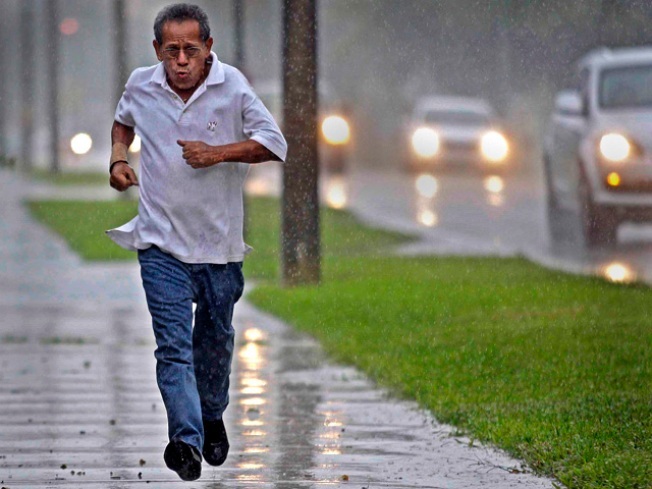 A man runs through the rain. The roads were wet in parts of the County for Thursday morning’s commute at the tail end of a potent storm that’s expected to linger in the mountains through the afternoon. “Preliminary rainfall figures are pretty amazing from this storm, especially when you consider that initial projections were calling for only light to moderate totals,” said forecaster Whitney Southwick. Oceanside, Escondido and Ramona saw almost 3-inches, while Julian, Santa Ysabel and Tierra Del Sol saw more than 3-inches. Mount Laguna had more than 4-inches. The rain was expected to end Thursday with partly cloudy skies through the weekend. “Another deep trough of low pressure is moving into California but we're not going to get rain out of it just a strong, persistent onshore flow which will keep things cool and cloudy,” Southwick said. By Sunday it should be dry and mild with highs in the 60s to about 70.